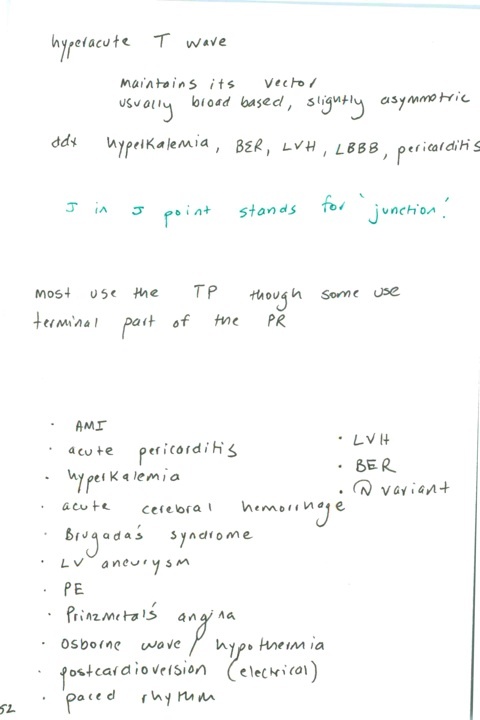 Step 2: Look for findings that define pericarditis. PR depression in multiple leads >2mm. But be warned, PR depression is not only seen in pericarditis. It can also be seen in STEMI, so don’t hang your hang your hat on it. PR depression is also transient. It can last from a few hours up to two days and is most associated with viral pericarditis than other types of pericardial inflammation. Step 3: If there is still a question as to what’s causing the ST elevation…Perform or order an echocardiogram. Pericarditis-may have fluid. MI-may have wall motion abnormality. Benign early repol will be normal. Serial troponins may help, but what really helps is an old EKG. Next PostNext 353. Features of benign ST elevation / ddx ST depression / In inferior MI, which lead most reliably shows reciprocal ST depression?